Ozcranes is the website of the Australian Crane Network so mainly concentrates on Australian Sarus Cranes», but we often refer to studies and include images from better-studied populations elsewhere. By contrast, this page specifically features resources and images for Sarus Cranes in other countries. 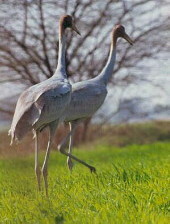 There are four surviving Sarus Crane populations: South Asia (India, with some in Nepal); Eastern (southeast Asia, mostly Cambodia and Vietnam); Myanmar-China; and Australia. These were previously thought to be three sub-species, combining Myanmar and southeast Asia, with the extinct Philippines Sarus as a possible fourth. Genetic studies now show gradual variation across the range , with Myanmar-China Sarus distinct from the Eastern Sarus. Philippines Sarus Cranes are now being studied for the first time (see below). 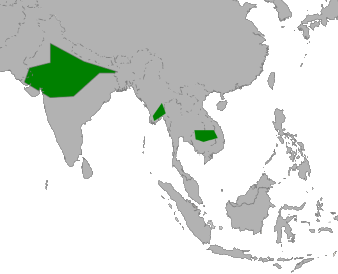 The Sarus Crane Asia distribution map is by L Shyamal, public domain. 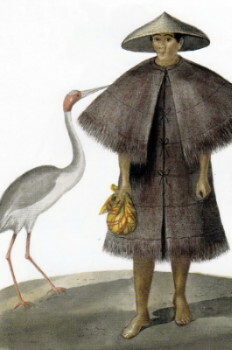 The Philippines Sarus, named Tipol in Tagalog, was thought to have been the smallest of all forms. It was probably extinct by mid 20th century. An excellent history by Christian Perez including the story of the 1847 painting can be found in the Wild Bird Club of the Philippines (EBON) newsletter. Material from Philippines Sarus is being included in genetic analyses for the first time as part of Tim Nevard's PhD Study», with the potential to add insight into relationships between the different forms of Sarus Crane. 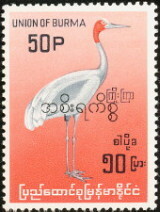 Although the Sarus Crane was included in a set of postage stamps featuring important Burmese birds in 1964, very little is known about the Sarus located in Myanmar and adjoining parts of Yunnan Province, China. In his ‘Catalogue of Mammals and Birds of Burma’ (1875), Blyth described Sarus as very numerous in the interior in large flocks, and cited a breeding reference. In ‘The Birds of Burma’ (1953) Smythies gives more details of habitats and locations including breeding sites, and reports flocks of up to 60 in ‘mid-monsoon’. Tin Nwe Latt, 2016. 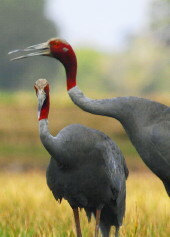 Sarus Crane Taxonomy, Habitat and Wetland Conservation status in Shan Plateau and Rakhine State. Conference Presentation, Wetlands Alliance Cambodia: currently (June 2017) offline. Eastern Sarus Cranes, Phu My Nature Reserve, Vietnam. Courtesy Mr Pau Tang & International Crane Foundation. In the last 50 years the Eastern Sarus Crane has disappeared from Thailand, Malaysia and much of Indochina. It is still in serious decline and multiple research and wetland conservation programs are underway in Cambodia and Vietnam. In Thailand, a captive breeding program has released Sarus into protected wetland areas in an attempt to restore the original population extinct since about 1980. Across southeast Asia the major threats are wetland drainage or other habitat changes, as well as hunting, egg collection and taking Sarus chicks as pets. 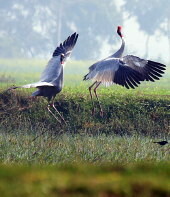 The South Asian Sarus Crane population of over 9,000 has been extensively studied, mainly in India with recent surveys extending to small adjacent areas in Nepal. Most Sarus Cranes in the region nest in irrigated wet rice fields, some in Uttar Pradesh remaining on their breeding territories all year. Their future is highly dependent on persistence of suitable agricultural conditions and favourable community attitudes. The spread of urban areas and industrial development across wetland areas increases threats from drainage, diversions, and mechanised agriculture, especially if combined with variable rainfalls. In Uttar Pradesh many immature Sarus collide with electricity distribution lines and are killed. Accidental poisonings from agricultural chemicals, egg harvesting, and invasive species such as Water Hyacinth and African Catfish in the renowned Keoladeo-Ghana National Park are also serious issues. 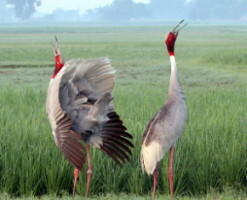 A comprehensive literature review for South Asian Sarus – KS Gopi Sundar & BC Choudhury (2003), ‘The Indian Sarus Crane Grus a. antigone: A Literature Review’. Journal of Ecological Society 15: 5-15 – can be read online or downloaded free in various formats from Archive.org. ↑ Eastern Sarus Cranes, Phu My Nature Reserve, Vietnam; courtesy Mr Pau Tang & International Crane Foundation. ↑ Sarus dance in Rupandehi, Nepal. 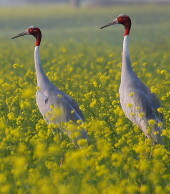 ↑ Sarus pair in mustard field, Rupandehi, Nepal.